The flower-rich chalk grassland of the Sussex Downs is a rare and fragile habitat that needs careful management if it is not to return to a scrub-land of grass, gorse and bramble. These grasslands are a semi-natural habitat originally created by tree clearing in Neolithic times and are maintained by grazing and cutting. They only occur in North West Europe. 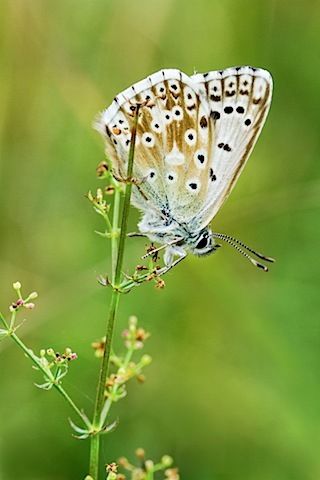 The UK, and in particular England, is thought to contain about half the world’s chalk grassland, Therefore, this is a habitat of international importance. 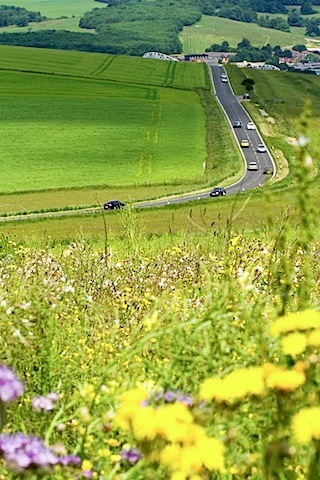 Since the 1940s, as more intensive methods of agriculture have been used, it’s estimated that 80% of chalk grassland have been lost because of urban development, extensive road building and failure to manage it, especially in the south east. 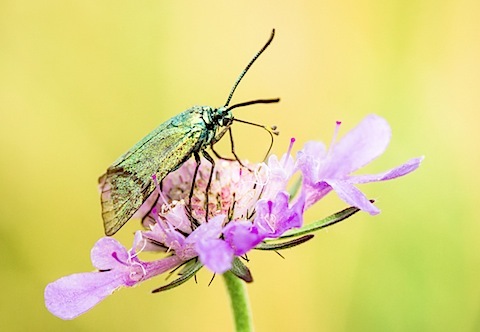 Chalk grassland is characterised by short, springy turf with a diverse mixture of lime-tolerant grasses, sedges and wildflowers with few shrubs or trees. These grasslands have a high biological diversity and consist of an exceptional variety of different species including a number of rare species of plants and animals. 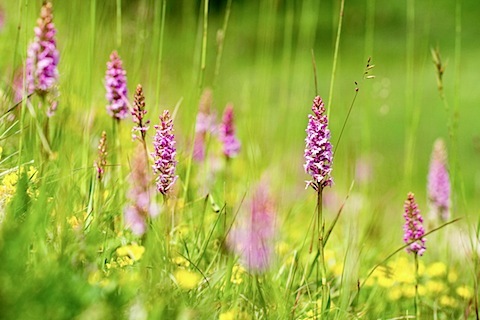 These include, pyramidal, fragrant, bee and spider orchids and skylarks and corn buntings. The thin, low-nutrient soil can be incredibly rich in plant life supporting up to 40 species per square metre. 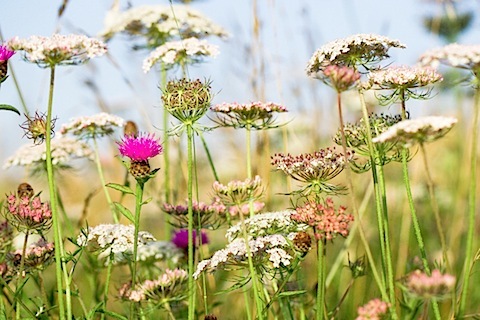 Plants include thistles, ox-eye daisy, cowslip, kidney vetch, bird’s foot trefoil, scabious, quaking grass, yellow rattle, viper’s bugloss and many more. 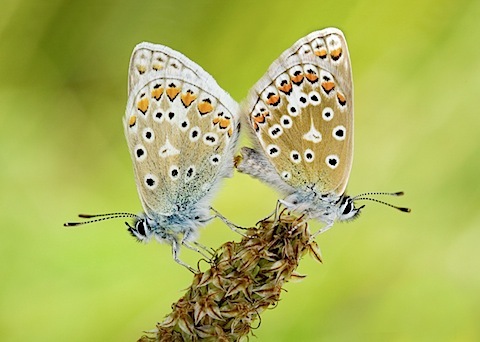 Some species are found nowhere else, such as the Adonis blue and Chalkhill blue butterflies. 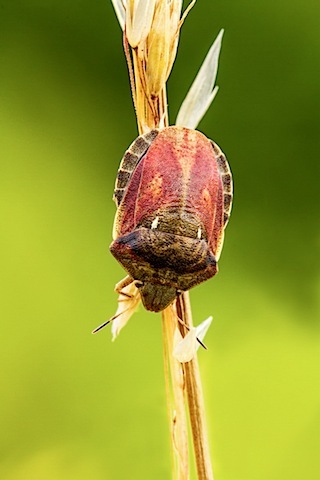 For the last two summers, I have visited The Gallops on the edge of Friston Forest near Cuckmere Haven in East Sussex and have taken many photos of insects and plants there. I was disappointed last week to find that the grasses had become dominant and there were far fewer flowering plants than previously. Consequently, I found it much harder to locate interesting specimens or any interesting behaviour to photograph. I was told by a local, walking her dog that the horses are not using the area so much for training and that the grass is not being cut down for them. Already, there were young bramble plants, which the rabbits and sheep don’t like to eat, appearing throughout the area. This is where an estimated 850,000 Chalkhill blue butterflies appeared two years ago this week. I was equally disappointed on revisiting an area near Wilson’s Avenue in East Brighton. The grass seemed to be taking over and I saw only one roosting Marbled White butterffly at dawn and just a few Six-spot Burnet moths. 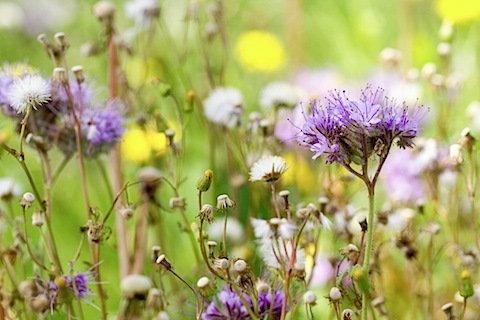 The field scabious was struggling to be seen as the tall grasses towered above the flowers. How quickly the habitat can become degraded.